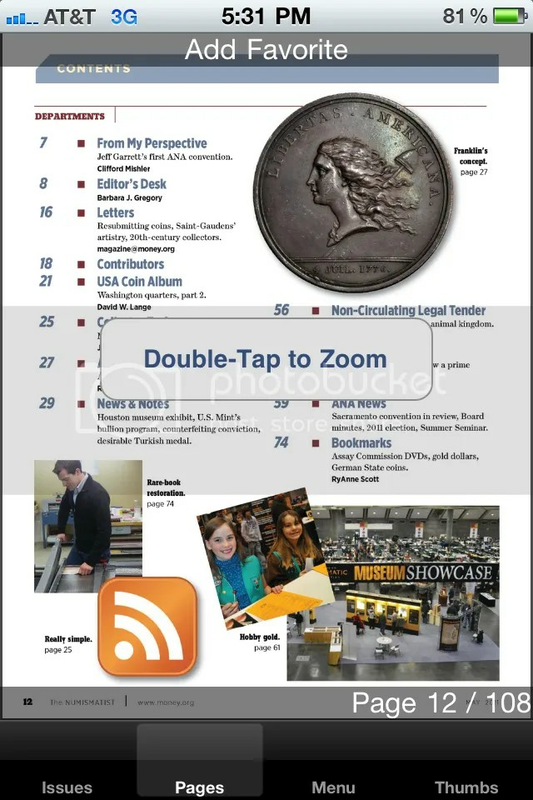 Back in March I asked, “Where’s my e-Numismatist?” A few months later, the American Numismatic Association released two apps for iPhone and iPad users to read The Numismatist electronically. Since I had to travel recently, I felt it was time to use and review these apps. During the last week, I had to travel for family business and brought both my iPhone and iPad with me to have content to keep me occupied between business. One of the apps that I was interested in exercising was ti read The Numismatist on the iPhone and The Numismatist HD version for the iPad. First thing that you notice is that although the programmers tried to make the experience similar on both devices, the additional screen space on the iPad makes it a better experience. But the iPod version is very serviceable using options available in the application. 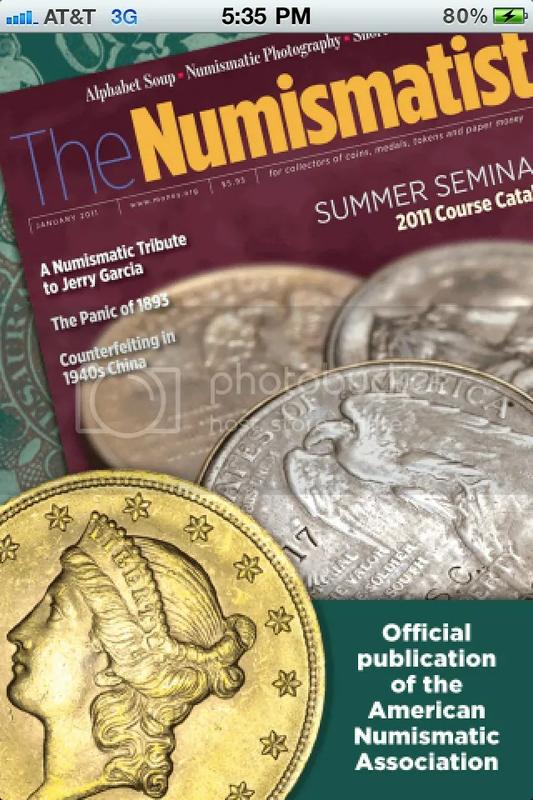 After the obligatory splash screen, the reader is presented with a screen showing the covers of The Numismatist to read. If you started reading an issue, the corner of the cover is folded down and the page number of the last page you viewed is displayed. If you have not read or downloaded an issue, there will be a down arrow button embossed over the image. Press the cover of the issue you want to read to begin. 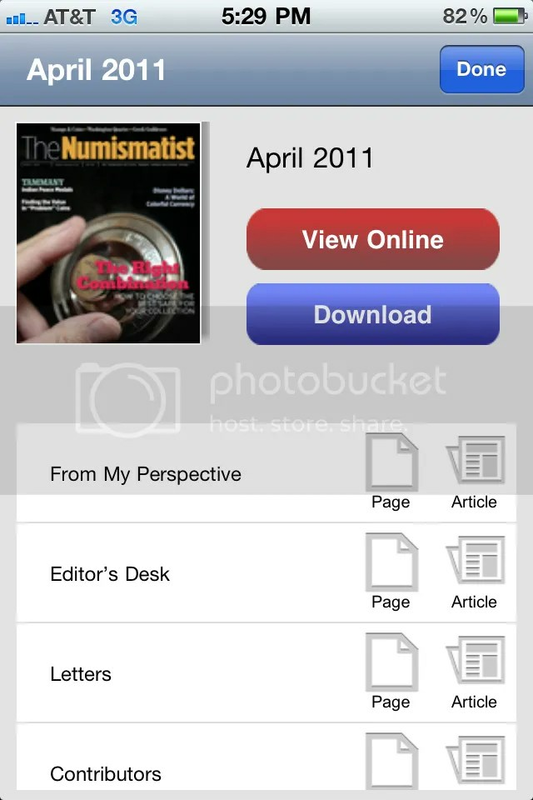 If you open a new issue, you are shown a table of contents with an option to download or read online. If you are going to be connected to Internet, you can read it online. Reading online means that as you turn the virtual pages, they will be downloaded on demand. By clicking download you will download the entire issue. In either case, this is where you find an initial problem with the app: downloading is slow. 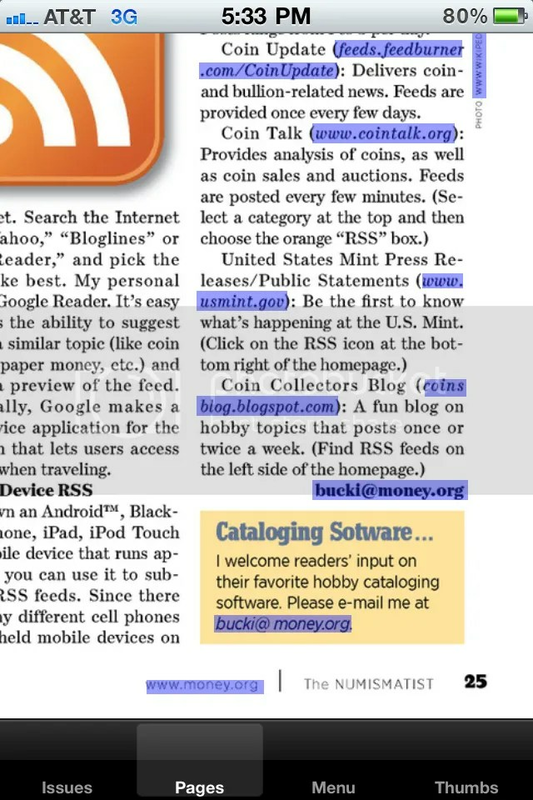 When I first tried to use the app, I was reading the May 2011 Numismatist using an iPhone connected via 3G over AT&T. Trying to go from section to section was so slow that it was painful. After switching to a WiFi connection that was routed directly to a broadband connection, it was faster and almost as painful. I switched phones from my iPhone 3G to an iPhone 4 and the pain continued. After continued frustration, I used some online tools to figure out that the images of The Numismatist pages are very big. The amount of data being downloaded seems excessive. Since my iPad is WiFi only and I wanted to read the June 2011 edition on the plane, I chose to download the entire issue because I will not be connected. Watching the progress of the download is almost like watching grass grow. With each issue over 100 pages, it took a long time to download. Also, I am not sure if it is a system issue or the way the app is written, but the download slows if I used another app during the download. Anecdotally, I have run a streaming music app while downloading an app from the App Store and reading email with more success than downloading an electronic issue of The Numismatist. I started the download of the July 2011 edition before going to sleep on my last night using my hotel’s WiFi service. When I awoke the next morning, the edition was downloaded allowing me to start reading on the plane trip home. Once the issue is downloaded, the app is nearly wonderful. For iPhone users, most of the articles could be read using the text-only option. This will show the entire article text without any images. Since many of the images are embellishments from iStockphoto, you would not miss much. However, articles that show numismatic items should be viewed with images. Reading the image pages on the iPhone shows the downside of the small screen, but you can double-tap the screen then use the open pinch motion to expand the text to be readable. Reading imaged pages is more comfortable on the iPad. The screen size of the iPad makes it suitable for reading in portrait mode. In landscape mode, the iPad will show two facing pages. Like the iPhone, the page can be resized after double-tapping to zoom in. Regardless of whether you use the app in portrait (preferred) or landscape mode, you get the full experience of dead-tree version but in electronic form and with links. In keeping with it being an electronic version is that links are embedded into the pages. Some links help in the navigation of the issue. For example, the table of contents contains links to each of the stories. If you find something you like, tap the name and the app will advance to that page. If you read an advertisement that you want more information, you can tap on the link in the ad you will be directed to the vendor’s website. Same for links embedded into stories. Email links will open a blank message with the email address in the “To:” line for you to send a message. My one complaint about links is that links to webpages are limited to the embedded browser in the app. After tapping a link, the screen will “raise” a browser insert and show the webpage. With the webpage open, you can expand it to show in the full screen or close the browser pane. The problem is that I may want to open the page in Safari so that I can bookmark the page. However, the app does not have an “Open in Safari” or “Bookmark Page” option. Many other apps can do this and should be added to The Numismatist app. One annoying “feature” of both versions of the app is that you cannot advance pages when zoomed in. Once you double-tap to activate the zoom, you have to double-tap again to return to “page mode” in order to turn the virtual page. It was annoying that while being engrossed in a longer article, I could not turn the page until I remembered to double-tap again. After advancing to the next page, I then had to double-tap to zoom in again. After a while, I put my glasses back on so I could read the text without relying on the zoom feature. With two flights of over an hour, I was able to read the entire June issue and half of the July issue on the iPad. Even with the annoyances, I found it easier to carry along with other electronic publications than dead tress. Even without the app being fixed, I am seriously considering converting my membership to electronic delivery only on my next renewal. 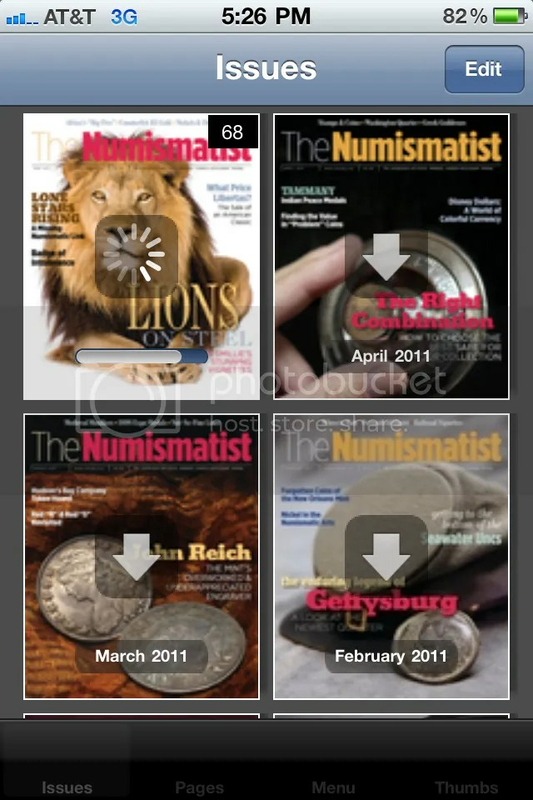 I grade The Numismatist app and its HD counterpart for the iPad MS63. Although I recommend the iPad version over the iPhone version, the iPhone version is very usable—but consider using it on an iPhone 4. Using the app on an iPhone 3G or 3Gs shows the limitations of that hardware. If you want to consider the e-subscription only, make sure you have an iPad. In addition to the iPad’s other advantages, this app makes it worth owning one.